Feb 19 - On this drizzly morning I took my last shot at Pacific Golden-Plover at Tijuana Slough but struck out for the third time. By this point I had spent about 8 hours in total looking for this species between here and Salton City...time to tip your cap and move on Nick! Knowing that the next bout of rain would be arriving in LA about mid-afternoon, I made sure to leave San Diego early enough to be in LA by noon. 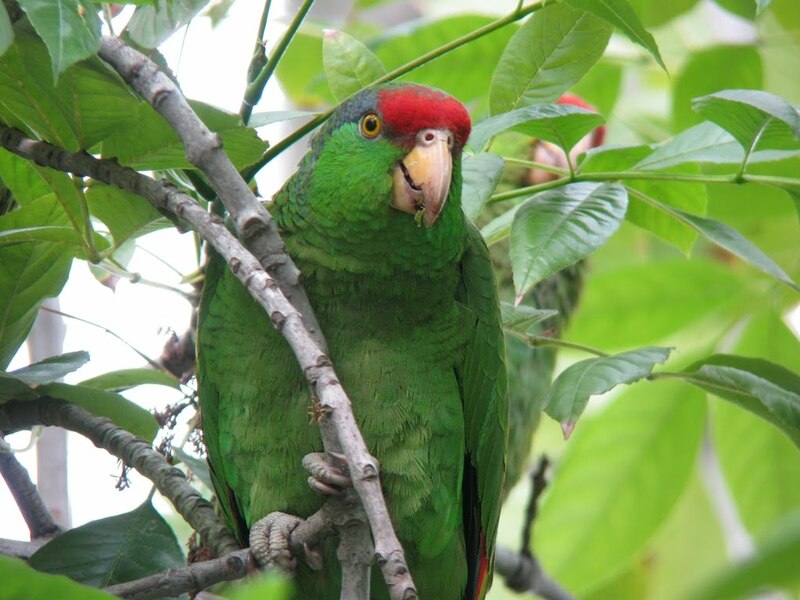 My two targets in the greater Los Angeles area were both established exotics: Spotted Dove and Red-crowned Parrot. Spotted Dove has drastically declined in southern CA, and there are only really a couple reliable locations left. The best spot is Salt Lake Park in Huntington Park. I parked by the ballfield and walked north through the park. After about 10 minutes I saw a pair of Spotted Doves on a powerline above a house across the street. On my way back to the car a third bird was calling from a tree in the park itself. The Spotted Dove was purely a tick-and-run. I didn't take much pleasure in either the setting (crummy neighborhood) or the bird (introduced, and not much to look at). Let me go on record by saying that I do not enjoy Los Angeles and vicinity. Driving through the city and surrounding neighborhoods I kept thinking of that old DCFC song "Why You'd Want to Live Here." Many truths buried in those lyrics! OK, one exotic down and one to go. Next up was Red-crowned Parrot. 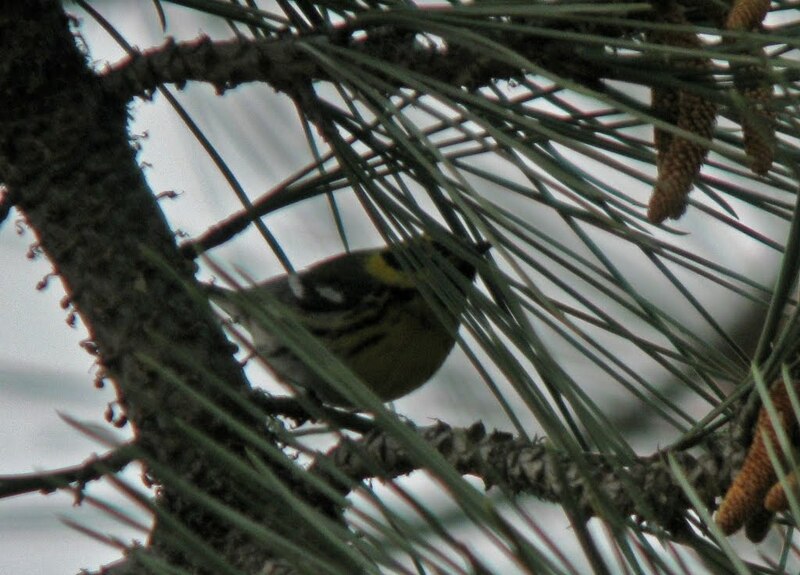 I headed to Tournament Park, part of the Caltech campus in Pasadena, to follow-up on a recent eBird report from here. 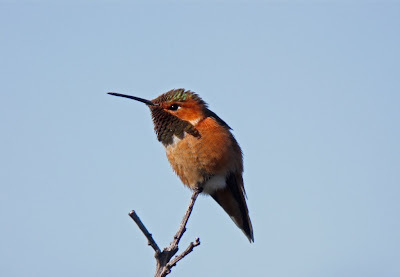 I had my doubts as I pulled into the small parking lot of this suburban park, but as I stepped out of the car I could hear Allen's Hummingbirds displaying - a life bird that I wasn't really expecting until I got to Santa Cruz Island. 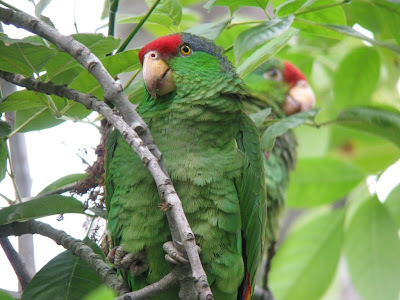 I continued along the narrow tree-lined path and glanced up to spot a few still and silent parrots, among them the countable Red-crowned Parrots and a couple Yellow-headed Parrots. There was actually quite a bit of activity in the area and a flock of warblers moved through the trees including one each of BLACK-THROATED GRAY and TOWNSEND'S WARBLERS. A SUMMER TANAGER, presumably a pretty good bird here, was calling loudly. Just as I was leaving, a pair of Band-tailed Pigeons flew into a pine tree in the parking lot. Not bad for a tiny suburban park! From Pasadena I drove up to Ventura where I would meet good friends from home, Frank Gallo and Vanessa Mickan, who were also birding SoCal. I arrived late in the evening and we birded Ventura Harbor at dusk where we had a first-cycle GLAUCOUS-WINGED GULL, a drake GREATER SCAUP, and a few SURFBIRDS on the jetties. Afterwards we thoroughly enjoyed dinner & drinks as the rain poured down. Feb 20 - Temps really dropped overnight, even on the coast, which was made very apparent by the frozen water droplets on my rental car at dawn! I soon got over the flashbacks of New England weather and headed to Ventura Harbor to catch a boat to Santa Cruz Island, the home of the Island Scrub-Jay. 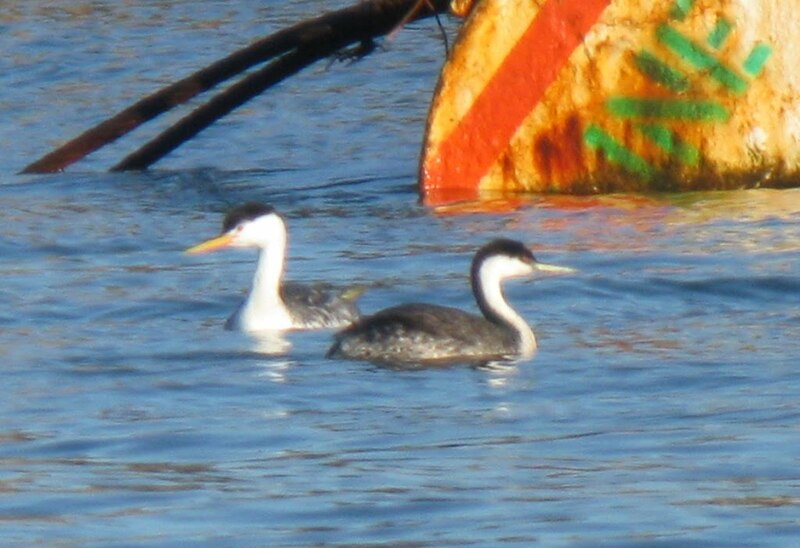 The harbor itself held many Western and a few Clark's Grebes. The ride out was choppy and not very birdy. 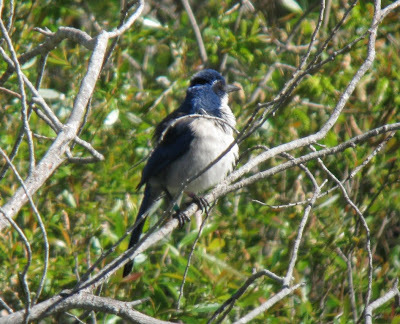 I got off at Prisoner's Harbor and started on the guided tour to the best scrub-jay locations. 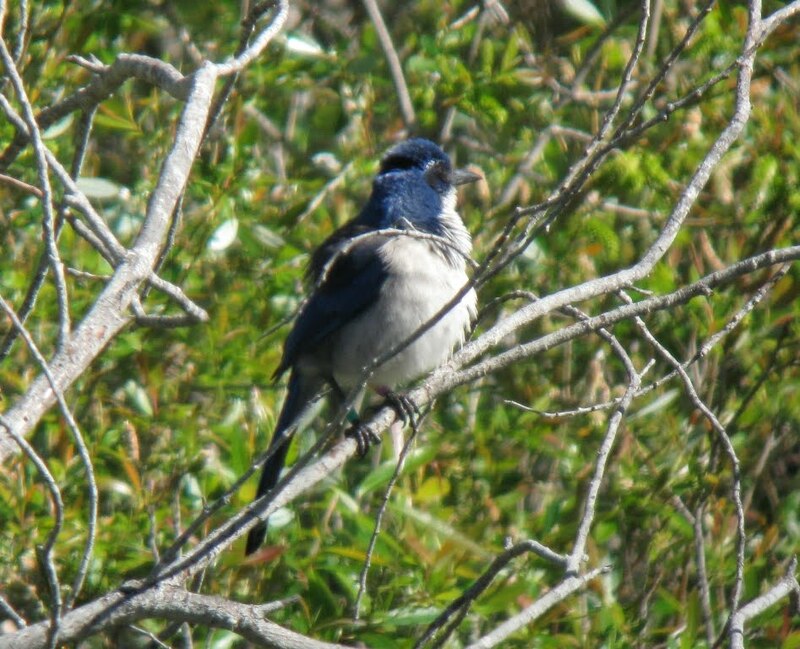 After a bit of a wait we were able to locate a few ISLAND SCRUB-JAYS. The jays weren't terribly cooperative but we all got our looks. After catching up with the jays I broke off from the group and saw a few of the islands' other endemic birds including subspecies of Orange-crowned Warbler, Bewick's Wren and Song Sparrow. I pished up a "THICK-BILLED" FOX SPARROW, not a bird I was counting on seeing this trip. 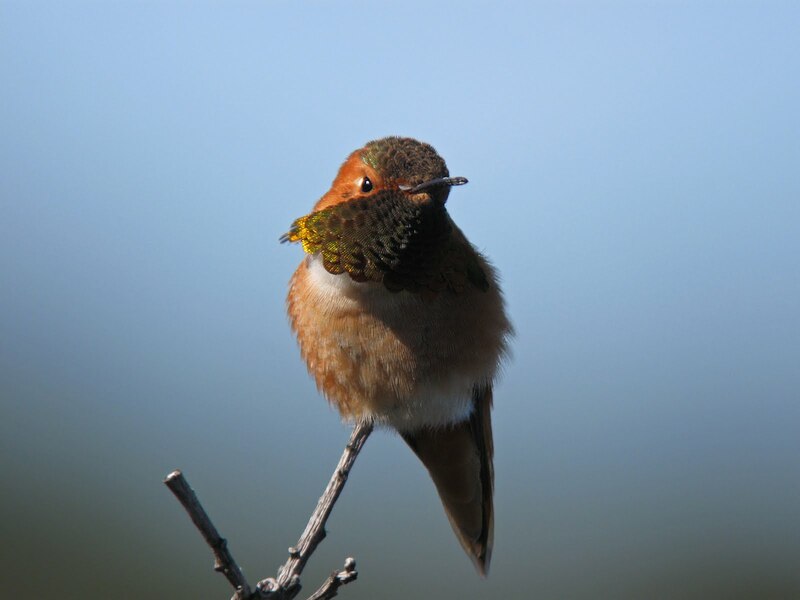 Allen's and Anna's Hummingbirds were zipping around. 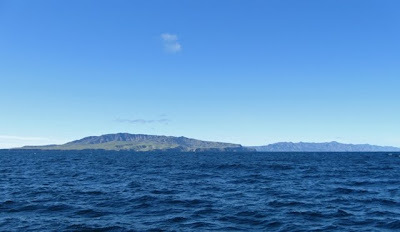 The boat ride back was calmer, with the sun at our backs, making alcids much more visible. We had double-digit totals of CASSIN'S AUKLET, RHINOCEROS AUKLETS, and COMMON MURRES. Interestingly, all of the murres were in basic plumage; at this time of year on the east coast, most Common Murres are in alternate plumage, just like this bird in Connecticut a couple weeks ago. I discussed this with Frank, who noted the same thing when he and Vanessa took the same trip a few days prior. After the boat returned I drove back down to San Diego for my flight home early the next morning. More posts to come on this highly successful trip. 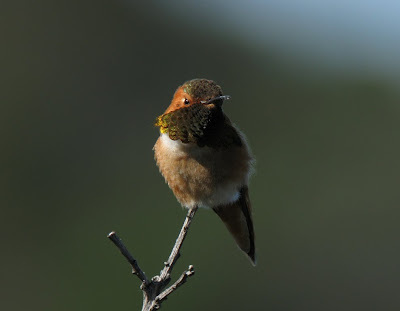 Love the hummingbird pictures. Great shots, Nick!